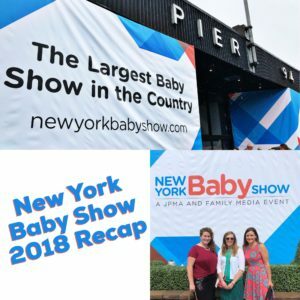 New York Baby Show – 2018 Recap! Was it hard to get to? Nope! I drove in Saturday morning, & it was surprisingly easy to get to the event. You don’t have to deal with true inner NYC traffic since the event is along the water, which made the drive-in surprisingly simple (even in my giant mini van)! Parking was also a breeze. I parked in a Pier parking lot right near the event that was both affordable and close to the event itself. It was nice to know that we could run out to the car and grab a snack, water, or more business cards at any point throughout the show. Since it is the largest baby show in the country, you would expect it to be overwhelming, crowded, and stuffy; however, that was not my experience. The venue is so huge that it can fit a surprising amount of people and all of their strollers without it seeming too crazy. Is it busy? Yes! But you are still easily able to navigate around the venue, see all of the vendors that you want to see, & take a break in the Mom or Dads Lounge whenever you need it. What cool products did you find? My older son loves chess. He is a very black & white, logical kid who loves the game for what it is. On the other hand, my younger son adores fairy tales and adventure. Typical chess seems boring and plain to him despite our best efforts. Which is where Story Time Chess comes in! The people behind this genius product have been tutoring children in chess for decades using this kid-friendly, heart-warming, & vibrant method; but now they are making it available to everyone! Story Time Chess comes with a story book, a game board, & chess pieces with character cards on them. Each character/piece has a story behind why they move like they do, which makes the game fun & easy to learn for children as young as 3 years old! Swaddle UP by Love to Dream is a product that I wish I had had when my own boys were babies. Everyone tells you that you should swaddle your baby, but no matter what I tried, it didn’t work for my boys! I had a whole collection of different brands of swaddles, & no matter what, my boys would manage to free their arms like little escape artists. What I didn’t realize at the time was that this was very common & very natural. Babies want to have access to their hands. They want to self-soothe by caressing their own cheeks or moving their hand to their mouth. But traditional swaddles don’t allow for this. The Swaddle UP allows baby to be comfortable, soothe themselves, stay safe, and soften the startle reflex! It also has a double zipper that allows for easy, middle of the night diaper changes. I got started in the world of writing when I was pregnant with my first son, which means that I have done A LOT of typing with a baby on my lap. This sounds sweet & wonderful, but in reality, it can be difficult & frustrating. I would type full articles sideways & one-handed while trying to keep a squirmy baby away from the keyboard. Which is why LapBaby instantly caught my eye! LapBaby is a great, affordable solution for keeping your baby close & secure while still having both hands free to type, eat, or even play video games 😉 It is also great for airplane travel or other fun adventures. I have taken my babies on trains & speed boats & would have loved to have the option to be hands-free while keeping my little one close! Should I go to the New York Baby Show? If you have a little one or are currently pregnant, it is a great event to go experience! You will get to see so many unique products, enter various giveaways, & receive free samples all along the way.